Plus ca change! 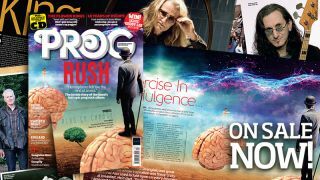 Rush are on the cover of the new issue of Prog on sale today! The new issue of Prog is on sale today. It's been 40 years since Rush last recorded a side-long prog rock epic. And that was on the Hemispheres album. With a brand new box set of the album due out, we sat down with Geddy Lee to discuss the making of the album at Rockfield Studios in Wales and its impact on the band's career. We also talk about Geddy's new Big Beautiful Book Of Bass and there's a chance to win your own signed copy too! Irmin Schmidt - the Can founder looks back on a career that stretches back over 60 years now. Kscope Records - a celebration of the post progressive label as they celebrate their first ten years. The Flower Kings - there's a new Flower Kings album out, but all is not well in the camp according to Roine Stolt. England - the great lost British prog band from the 70s finally get the chance to tell their story. Twelfth Night - the 80s neo-proggers are back in the studio. We discover what the future might hold! Rikard Sjoblom's Gungfly - the Swede returns to his childhood for inspiration on new album Friendship. Voices From The Fuselage - the young British prog rockers get deep and personal on their latest album. Sanguine Hum - the complexities of the buttered cat still occupy the band's thoughts on new album Now We Have Light. Antimatter - Mick Moss weaves uncomfortable tales from the dark side on the Liverpool band's latest album. Shattered Skies - the Anglo-Irish proggers muse on the impact of social media in today's world. AlithiA - The Aussie proggers recall the harrowing experience of recording new album The Moon Has Fallen. Colin Moulding - the former XTC bassist tells us all about his new outfit TC&I. Sarah Brightman - in Prog magazine? Yes, there's a ton of prog connections for you to discover here. Anneke Van Giersbergen - the Dutch prog singer lets us into her prog world. And music from The Windmill, Marcela Bovio, Dilemma, Tall Talker and more on the CD. You can buy the latest issue online here. Or use our store finder to find your nearest stockist.